Did you know that there’s a tree that’s moved on its own accord in the middle of a lake for hundreds of years? A machine that used leeches to predict the weather? A field littered with gigantic, ancient stone jars, some still unopened? A festival where grown men see how many helpless infants they can run and leap over at once? 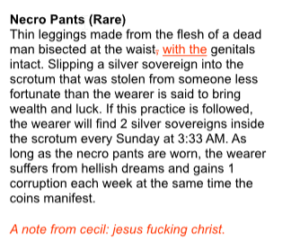 Pants made of human flesh said to bring wealth to its wearer? All of these things sound at least somewhat surreal, but they’re all very real. We know that most stories, no matter how fictional they may be have at least some nugget of truth within them. 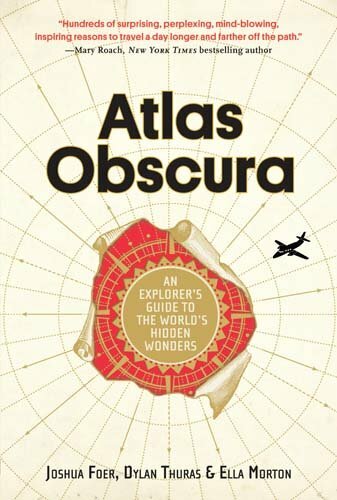 Atlas Obscura is an unending source of said nuggets, as well as an indisposable tool for me when it comes to writing adventures and campaigns for tabletop games. What started as a blog, now has its many years of arcane tidbits compiled into a lovely hardback that I tote around with me along with tarot cards and other inspirational materials for writing. The AO blog itself is great to frequent for so many reasons. 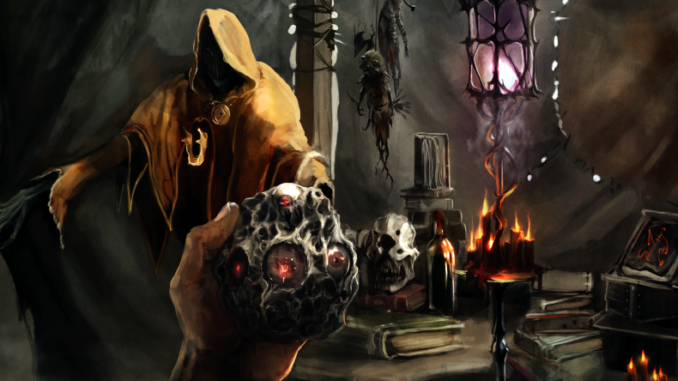 Beyond reporting on the strange-but-true, sometimes they do things like compile public domain art and show you where to download the full texts of old, obscure books about demons. Sometimes they have great photos of iconic places like the Orava Castle where the Nosferatu was filmed. Other times it’s just a post about a book full of wallpaper that could kill you. They also have Gastro Obscura if you’re a foodie, but let’s not digress too far for today. The fantastic pages of this book have given me plenty of inspiration, from the reward PDF I created for folks who buy me a coffee full of random objects and locales for your games, to my most recently published adventure about a child-thieving Krampus, and even down to a rightfully-rejected submission to my published work on Insupposable Instruments (seen to the left). Anyway, Atlas Obscura is wholly worth your $22 or at the very least, a visit to the blog . I can’t sing it’s praises enough, plus it makes for good reading in bite sized chunks if you’re a busy person who doesn’t have time to research tons and tons before your next game session and need a juicy idea. It also makes one hell of a coffee table book if you’re into those sorts of things to spawn conversation with guests. Give it a spin! Where do you get your inspiration from, especially anything that has some basis in the real world? Do you feel that you must consume to create, or do you just crank out ideas without much precursory thought? I’d like to know in the comments below!